Take a stroll down memory lane where Sandy, Candy, Randy, and Biff are waiting for you at the milk bar. Click here to play! Oh, and don't forget to pick up Dad's new Chevy Impala from the auto shop. Malt Shop Memories is an entertaining slot machine harking back to the golden age of the 1950s. Win on combinations of Milkshakes, Burgers, and even Roller Skates! The 3-reel, single pay-line slots game is a classic in every sense of the word. Its simplicity on adds to its appeal as you reminisce upon bygone days while taking away massive payouts. The Malt Shop Memories Wild symbol is the Milkshake. 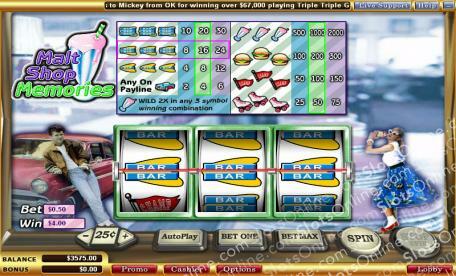 The Milkshake allows you to complete any winning 3-symbol combination, as well as increasing your payout. For example, if you land 1 Milkshake in a winning combo you will be paid twice as much, and if you manage 2 Milkshakes in a combination your payout will be quadrupled! Return to the Fifties and win big today in the retrospective slots game Malt Shop Memories. The Milkshake is Wild in Malt Shop Memories. It completes all winning 3-symbol combinations, and doubles the payout on a single Wild, as well as quadrupling it on 2 Wilds.